Would you like one catastrophe with your story? Two? How about a zombie apocalypse on top of it all? 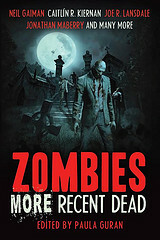 “Jack and Jill,” Jonathan Maberry’s story in Zombies: More Recent Dead, is not for the weak of heart. Evil comes in threes, as a family struggles to cope with not only the cancer gradually consuming young Jack, but a massive supercell crashing down on top of them. But if straining levees and possible tornados aren’t bad enough, Jack’s twin–Jill–is bitten in a strange riot at their elementary school. This is no Zomb-nado from SyFy. This is a cataclysm of the worst circumstances possible. The storm, the cancer, and the strange pale-faced people smeared in blood are bearing down on them, and Jack and Jill may not make it out alive. This is a great, terrifying story, compounding so many mortal fears into one story, it’s impossible not to feel the chill running up your spine. I’m a full-time professional writer. I write, on average, three to five novels per year, along with two monthly comics (V-WARS and ROT & RUIN), as well as short stories, novels and novellas. In order to hit all my deadlines without driving myself batty, I’ve learned to be efficient. Much of that discipline comes from my background as a journalist and fifty years of jujutsu. I write eight to ten hours per day. A little less on weekends. I do fifty minutes of writing each hour, and ten minutes of social media. I generally outline my work, then dive in and write the opening and then the ending. Then I go back to the beginning and aim everything at the ending. Naturally I vary from my outline during the organic process of writing, but I find structure allows me to be usefully devious when building the plot. Knowing where something is going gives you plenty of opportunities to build clues, develop characters, and sew motifs into the fabric of the story. As far as ‘waiting for inspiration’, I’m not one of those writers who buys into the self-created mythology of the writer. A writer writes. I don’t sit around like a tortured artiste waiting for the muse to whisper in my ear. 2. The Zombie Question: It’s a zombie apocalypse! Which three people (fictional or not) would you want in your survival team and why? What’s your weapon of choice? My ideal zombie survival team would include Sherlock Holmes (we need someone who is both hyper-observant and detail oriented), Jack Bauer from 24 (high-degree of combat skills and utter ruthlessness), and my nephew, Chris, who can repair and drive anything with motors and wheels. I’m in the middle of my busiest year. I’m currently writing a novel inspired by the DEADLANDS role-playing game and will then launch into a new standalone horror novel about a recovering addict searching for her son, and the monsters who want to stop her. I have a new zombie novel, FALL OF NIGHT, due out on September 2. I also have two new comics –V-WARS (a humans vs vampire ethnic war saga) and ROT & RUIN (based on my bestselling young adult zombie novels). Two of my books, V-WARS and EXTINCTION MACHINE have just been optioned for TV, so I’m working with producers on those. And I’ve recently begun work as editor on a series of anthologies of new X-FILES stories.